The founder of the Alec Bradley Cigar Co. talks about the reversal of fortune that put his smokes near the top. Alan Rubin wasn't born into the cigar business, and the timing of his debut—1996—hardly guaranteed success. The cigar boom had already reached its zenith, and when his first smokes were ready for sale a year later they entered a market with far too many cigars and too little demand. Soon deep in debt, Rubin told his wife he doubted whether he could make this industry work. 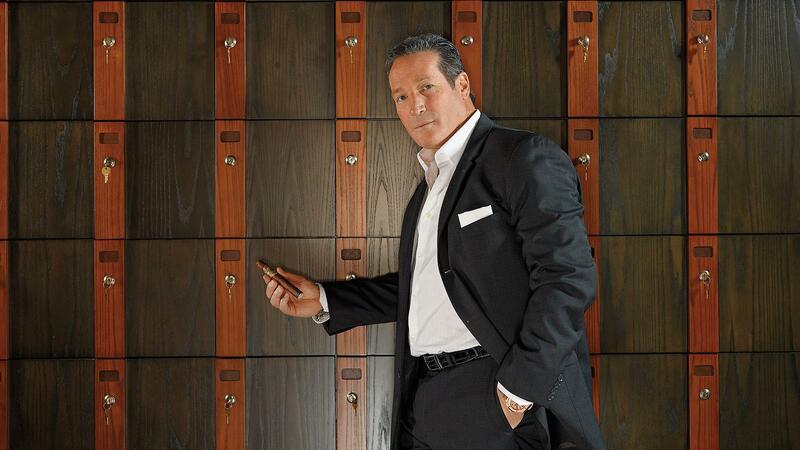 Today, the 49-year-old has established a firm foothold as the head of a boutique cigar company that consistently delivers high scores. His smokes have appeared on Cigar Aficionado's Top 25 list in three consecutive years, and in 2010 his Alec Bradley Family Blend T11 scored 94 points. In January, senior editor David Savona met with Rubin in Dania, Florida, at the headquarters of his small company, and over Alec Bradley cigars they discussed Rubin's journey through the cigar industry. David Savona: Let's go back to the beginning. Tell us how you got into the cigar business. Rubin: I was in another business. I was an importer of fasteners. I had an opportunity to sell the company. Whatever I wanted to do next I wanted to be passionate about. Q: Were you in business with anyone? A: It was with my dad, I joined him after college. It was a business that sold to cabinet companies. After Hurricane Andrew hit south Florida I changed the direction of the company to do hurricane fasteners. Q: Was that a higher-margin product? A: No, it was lower margin, but with a lot of volume. Our business was growing quite rapidly. We ended up selling. I didn't know what the next business was going to be. I wrote down a list. No employees, no inventory, something I could control. I got none of that. Q: So how did you decide on cigars? A: I was introduced to cigars when I was in my early 20s. I fell in love with the tradition. I always loved machinery, taking nothing and making something. I saw how you could take these leaves and make something out of them. Cigars had a history that technology couldn't make better. It was the fact that you couldn't do it quickly—you had to slow down. Even though it didn't hit anything on that list, the industry drew me in. Q: Why the name Alec Bradley? A: Those are my kids' names. And my dad told me always start the company with the letter "A", because it's at the start of the Yellow Pages. I never forgot that he told me that. Q: What was the name of the company your father owned? A: All Points Screw Co. My father has a lot of wisdom. When I was 10 years old I was in grade school and I was walking in line to lunch and I saw my father's delivery truck at the school. When I looked at the top I saw "Gloria Alan Industries." And I realized Alan was for me. And I never forgot the feeling of pride. I decided that if I could ever do something great in the cigar business I wanted my kids' names to be on the company. Q: When did you start the cigar company? A: I sold the other company in 1996, and I incorporated this business two months before the deal went through, and I went to the RTDA [the annual cigar trade show]. A friend of mine was a retailer and I walked the show. I loved the ambience. I couldn't get anyone to make a cigar then. I eventually found a small manufacturer in Honduras. It didn't work out very well. He was taking my money and not giving me product. A: That was under the name Bogey's Stogies, "The only bogie you'll ever enjoy on the golf course." We sold our first Bogey's Stogies in '97, until '99. I'm a Florida boy and I thought that people played golf 12 months out of the year in the entire country (laughs). It was kind of a faulty business plan. Q: So Bogey's Stogies wasn't doing well? A: I learned how to play Jai Alai in my warehouse, because we had plenty of space. I got very good at Wiffle Ball within our warehouses. Ultimately I met Ralph Montero. We exchanged numbers. He had worked with his uncle Pedro Martín [then the owner of Tropical Tobacco] and he went out on his own. And then the boom was over, and he was having a hard time selling cigars. And so was I. I asked about Ralph, everyone loved him. I said, "I need help." He came to work here in 2000. Q: Let's talk about what changes you made. A: I realized we had to get into the premium cigar stores. I said it was time to make a change. Timing is everything. That was the same time Henke Kelner [best known for producing Davidoff and Avo cigars] was looking for some production—everyone's production numbers went down because the boom was over. Ralph said, "I'm friendly with Henke—why don't you give it a shot?" I barely had enough money to buy samples. I had a partner who left in April 1999. When he left, we were very much in debt, over $60,000 in debt, I had about $3,000 in the bank account. I went to my wife and said I don't know if I can pull us out of this mess. I said I'm going to stay in the business long enough to pay off the debt, then I'll just probably get out of the business. Henke gave me some samples. He wanted to get the name of the factory Occidental out, so I called the cigar Occidental Reserve. We sent out samples to 500 cigar retailers with two cigars in each. I didn't put any prices on them. Q: You sent out samples, rather than selling cigars. How did that perform? A: That was the turnaround. We followed up with 500 phone calls. I said, "Could you sell this?" They said, "Yes. How much?" I said, "Probably $3 to $4." Q: And out of the 500, how many ended up buying the cigars? A: We probably ended up with 300 customers. That was a huge influx of customers. They were looking for a high-quality cigar that was inexpensive. And we sold it in bundles. People really gravitated to it. We paid off the debt. I said we have a little bit of momentum. It was a pretty exciting time. Q: When did you first think you could make this work—was this it? A: No. We had some moments within Alec Bradley's lifespan that have been big momentum pushers for us. Occidental Reserve helped us survive. When we came out with Trilogy, with our triangle press, that was great exposure and great distribution. Then when we came out with Maxx, all these big cigars at one price—any cigar at $5. You could get a 50 ring gauge for $5. Q: When did you consider the company safe? A: When we went from survive to thrive? That was Tempus. Q: When did you launch Alec Bradley Tempus? A: In 2007. Tempus was the first cigar that had Alec Bradley at the top of the name. That was the line we really wanted to launch AB on top. Every cigar that we did prior to Tempus was mild, mild-to-medium or medium. We never went much above medium. Tempus gave us a more full-bodied cigar, a little more strength, a high level of satisfaction in the flavor profile. It was really the next level of cigar for us. Alec Bradley became the brand with Tempus. We felt the cigar warranted it. Q: Let's talk about creating that cigar. A: When we were coming up with Maxx in 2005, Maxx was supposed to be made at the Raices Cubanas factory. We had already seen their Trojes tobacco, we knew it was great. But when we went to launch Maxx, it wasn't ready. A: Trojes is in the Jalapa Valley, on the Honduran side of the border [with Nicaragua]. Q: Does it have similarities to Jalapa, Nicaragua? A: Correct. We knew that this tobacco was special, and we felt it was perfect for Maxx. We realized it just wasn't ready, and we knew that they weren't ready for us yet. The timing wasn't right. So we told them, "Keep putting the tobacco away. Use what you need to use, but take the best of the best and put that away." Q: How did you meet up with Raices Cubanas? A: We had been working with them for a few years on a less expensive line, Spirit of Cuba. A: It's a small, family-run factory. The lead guy is Romay Endemaño, and there's his wife, Maria Portao, and son Hugo. Q: How small is it? A: Back then, 40 or 50 pairs [of rollers]. Romay [pronounced Rome-EYE] grew up in the cigar business in Cuba, became an engineer, ultimately ended up back in the tobacco business. He brought a lot of the engineering mentality: consistency and ideas. He was very exacting in his standards. From the growing of tobacco to the fermentation to how they rolled. Q: Today they're known for making Cuban-style cigars, with mounted heads. Were they rolling that way back then? A: Yes, everything was tubed [entubado] and triple capped. Even on a sandwich filler cigar. Q: Flash forward—the Trojes tobacco is ready. Now what happens? A: We went down to blend. We didn't have a name, we didn't have a concept. Ralph and I worked with Romay, and a gentleman named Luis. We came in one morning, and all these blends we had been working on were on the table waiting for us. I lit up this cigar, first thing in the morning, and I said, "I need some air." I went to walk down the steps and I almost missed one. I said, "I think we have something here—it has strength, it's well balanced. Tomorrow I'd like to smoke this again, but we need to smoke it outdoors—I need to breathe." We lit up the blend, and I had everyone light up before me, so I could smell the aroma in the air. I absolutely fell in love with the aroma of the cigar. I lit up my cigar, I didn't say a word, and I looked over at Ralph. I nodded my head, he nodded his head, and we knew we had it. Q: Why the name Tempus? A: Tempus is Latin for time. We knew about the tobacco many years before this. We waited, we were patient. We allowed the tobacco to be what it is. The whole line is about time. Q: How was the reaction? A: Absolutely over the top. The cigar smoking community was waiting for Alec Bradley to do something special. Q: Did Tempus introduce you to a different type of customer? A: It did. You start out as a baby, you're eating Cheerios and rice. As you grow, your palate widens, you want more satisfaction, you want more flavor. You want that feeling. Tempus gave us a line that was more substantial. Q: Did it also open up a new price point? A: When I first started we were selling cigars that were around $2, and then Havana Sun Grown was a little more expensive. But we gave them more. Regardless of price, if they get more, if the experience is worth more than they paid, generally the consumer is very happy. Q: Is that your philosophy? A: I think price and value are mutually exclusive. If a guy spends $20 for something and it was a $50 experience, you're still happy. Q: You sell cigars that someone else makes. Do you think there are misconceptions about companies like yours, that don't control their own manufacturing? A: I think so, because I think they don't understand the involvement. I don't know what other people do. From our side, we're involved in every part of it. When we came to do Alec Bradley Prensado, Raices had not done a box-pressed cigar. I showed them what we needed to box-press cigars. We try and bring something of value down to Central America or the Dominican Republic when we go there. Q: How many factories do you work with? A: We work with Raices Cubanas [located in Honduras], we work with Nestor at San Marcos and also in Danlí [Honduras], we work with Henke [in the Dominican Republic] and then we work with Nestor in Nicaragua. Q: Do you ever see the day when you will have your own manufacturing operation? A: I do. In doing a partnership, so that we don't get so caught up with manufacturing that we don't stop taking care of our customers in the market. If we partner with somebody in the factory it would be because we're on the same page. We want them to continue what they do best, but grow together. Q: Let's talk about Family Blend. A: This was a blend we did for our fathers here in the office. Their signatures appear on every box. When Tempus launched, we couldn't keep up with production, so when we would do events we handed out Family Blends with no bands. We didn't have enough Tempus. And people liked the damn thing. People went nuts. People asked what is the cigar with no band? Ralph and George [Sosa, the vice president of sales] and Christopher [Manso, one of the company's Midwest sales reps] sat me down and said we have to bring the cigar out to market. Q: When was Family Blend launched? A: April 2009, when it had one size. Q: And today how does it match up? A: It's probably in our top three. Q: Take us through your product line. A: Spirit of Cuba sells in the $2 range. It's a sandwich fill cigar [made with long and short filler]. This is what we call our transition cigar. We have Maxx, we have Maxx in Connecticut, we have Maxx The Vice, Tempus Family Blend, Prensado, Select Cabinet Reserve—those last three all were launched in the same year, all sell for $6 to $12. Q: What are you missing? A: Maybe a lower-price product, lower than our typical seven-, eight-, nine-dollar range, that we're proud to put our name on. When you're using quality tobaccos, you pay for that. When you're using aged tobacco, that's money that's been sitting for years. It's about being able to provide a product at a certain price point that we're happy to put our name on. Q: What's the best cigar you've ever made? A: Wow. That's a great question. (Long pause.) I think the one closest to my heart is Tempus. That helped us get to where we are today as a company. I smoke all of our cigars, but Tempus is probably the one closest to my heart. Q: How many cigars does Alec Bradley sell each year? A: Between two and three million. Q: Is that your goal? A: This is exactly where we want to be right now. The company has truly taken on the personality of the people in these walls. It's not one person here, it's a team. We have nine employees here. They always say hire where you are weak. My job is to lead the direction and then get out of the way of success. Let these people be the best they can be. Ralph is executive vice president. Ralph is very structured, George has a military background, Lori Bond [inside sales manager] can remember 1,000 customers' names without a computer. Our company has very much a family feel to it. You don't have to have the same last name or be the same ethnicity to be a family. Q: Is Ralph No. 2 at the company? A: He is—maybe one and a half. He runs the daily operation. He makes sure that the wheels are going forward. And it's really a perfect marriage—he's the Cuban brother I never had. I see all gray and he sees all black and white. Q: Who is the typical Alec Bradley consumer? And how is that person different today, versus the typical consumer you sold to in 2000? A: The Alec Bradley consumer 10 years ago was the consumer who was looking strictly for value. Today, the Alec Bradley consumer is the consumer that is a little more educated about cigars. The guy who understands he had a great experience and he wants to know why. He wants to know why he is enjoying the cigar as much as he does. I was in New York going from one store to another, and I saw a cab driver, and he had a cigar. I took out a Tempus and he said "Alex Baldwin—I smoke those!" He got our company name wrong, and he got the actor's name wrong, but from five feet away he recognized our brand. It was at that moment I realized we had something. Building a brand is the hardest thing I've ever done—but it's also the most rewarding. I never thought I'd get to this level. When I got into this business there were people that were untouchable. Out on top of the food chain. Now I feel every company is within reach. There's a book that I once read that said, if you're not No. 1 or No. 2 in your category you should really switch industries. And I say that we can be No. 1 or No. 2 in this industry if we keep doing what we're doing today, doing quality first. Q: When you joined the cigar industry there were certain challenges—the cigar boom was ending, there was a glut of product on the market, sales were far from easy and you were a new, unproven company. Today, there are different challenges. Can you describe and contrast? A: When we started, nobody knew who we were. I travelled four days a week, every other week, introducing myself, just going from one cigar store to the next. There's a lot of rejection involved. And having to do it again and again. If it wasn't for the support of my family, my wife, my kids, I couldn't have done it. There were certain months that I didn't travel. That was all based on my kids' sports schedule. That was how I created the balance. For 10 years I coached them in every sport. Q: What's special about the cigar business? A: The common bond of the cigar. No matter what you do, no matter what your walk of life is, it all goes out the door when you're smoking a cigar. I've been in a store where a guy who owned an oil company, a guy who pumped gas and myself smoked a cigar together. Where else do you get that? Q: What do you want from this company? A: I want to look back 20 years from now and know that the company has the same philosophy that we have today—giving the cigar smoker an unforgettable experience. So people will say, "They lasted because their quality was everything they said it was going to be." When you have an hour to smoke a cigar, that should be the best hour of your day. We want to be part of your best hour of the day. And there's a big responsibility there.